O’ James Gang – Some things never change, or … why do you have to leave? My family and I moved to Ocean Beach in 1966. What a wonderful place it was then. There was always a lot of activity on Newport, and there were so many stores that the locals could shop at and find almost everything they needed: Lownes Department Store; Elms Men Clothing; Para’s Book and Magazine shop; Denny’s Restaurant and later Mayfair Market. Safeway was where Apple Tree is now; Coronet was such a fun place to nickel and dime shop – (us old timers called it a “Five and Ten Cent Store”). And then there was the Pet Store on the corner of Newport and Cable; a fancy children’s shop where I bought all of my daughter’s clothes; the old Rexall Drug store with the wooden floors, etc. And right on the southwest corner of Newport and Cable Streets opened the“James Gang.” Wow! They could do any type of printing you wanted; business cards, business forms, shirts, souvenirs, and this was in 1976, way before computers were on every person’s desk. My husband and I had just gone into business making “Musical Seashells”. (What’s a “musical seashell” you ask?) We would find seashells that were big enough to implant a music box in the cavity; drill a place for the key, and voila! A musical seashell. Later on we made musical seashells utilizing Manzanita, driftwood, etc. We did a lot of shows during the beginning of our business. We needed something that would set us off from other vendors doing the shows with us. “The James Gang” developed our “personalized” shirts, complete with the Shamrock and “O’Curry” logo. Those shirts are THIRTY-FIVE years old and they look as new now as they did then. And…we wore them almost daily! Quality like that is not easy to find in today’s time. I read in the OB Rag that “James Gang” was looking for a buyer; it was time for them to leave and pursue other venues. One more place of history was getting ready to leave. True, it may still be “The James Gang”, but it will never be the same. I had made an appointment with Holly – not a “gang member” but a wonderful addition to the “family” – to have some shirts made up honoring the memory of my husband Bob. He died of lung cancer 18 months ago and the Lung Association is having their annual walk on May 1st. The Lung Association gives out shirts, but I wanted to have something from the James Gang for prosperity purposes. Not only was I met by Holly, I was also met by Susan – the wife of Pat – who also came to meet me. They were aware of my articles for the OB Rag; we reminisced about the Newport Ave. store, and the making of the original shirts. No one would know that they were going to leave OB. They were as friendly and helpful as they were that eventful day in 1976. I ordered the shirts for my “team” of walkers, and they were a little saddened to think that this might be the last time I give a special order to the James Gang. If you have something special you want done – even if it is only one shirt – do it while the original “gang” is there. You will really enjoy yourself – and there won’t be another time. Another landmark is leaving our neighborhood. As they say, “Ocean Beach, I hardly know ye now”. A swell article Judi. I always stopped at Coronet to find an OB oddity and never left empty handed. PS- I want to see/hear one of your music boxes! Thanks for the plaudits, Anna. I will bring a musical seashell to the next meeting. Nice post. We lived on Del Mar in Ocean Beach just over the hill from the sub base. Then moved to Montalvo ST where we bought our first house with white picket fence. That was before Sea World moved into the area. Funny, I was just thinking about the area the other day. I’m sure I wouldn’t recognize it now. You probably ate popcorn at the Strand Movie Theater along with the rest of us. Remember those cushy red velvet seats? You are right – it is hard to recognize now even though a few of the “staples” are still there: Hodad’s, The Black, OB Hardware store, although their location has moved a few storefronts to the west. You should come by some time – just to look. I remember having my hair done next to Doc Mitchell’s optometry shop. The optometry shop is there but not the beauty shop nor the aquarium shop that was next to it. Heck – even the “Christian Science Reading Room” is gone and that’s in the past 10 years or so. The Village Restaurant is still there, and the same owners are running it. But as one business after another leaves – James Gang, for example, my grandchildren will never know the eclectiveness (?) of Ocean Beach. I’ve only lived in OB for two years, but spent over 30 yrs visiting it. It sure has changed, and I still love it! Sorry to see another institution go like James Gang, they do have cool stuff. Will have to stop by and pick something up soon. Lot’s of great memories after 35yrs. 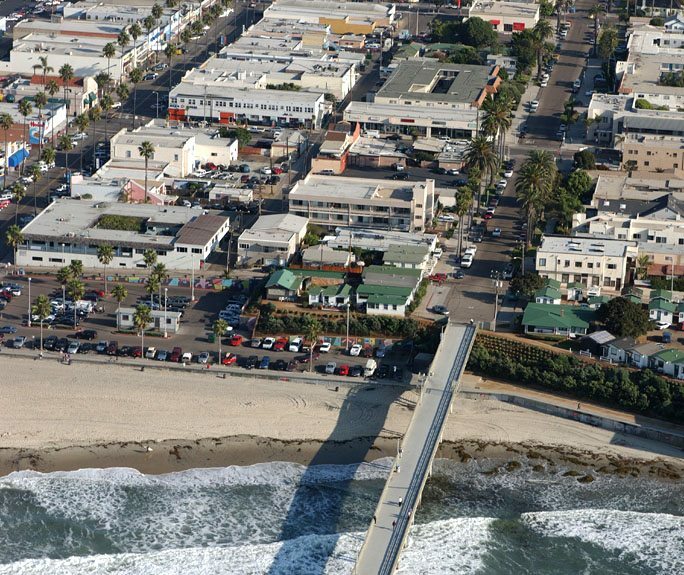 I grew up on Cape May Ave, up the hill, by where Santa Barbara St and Venice St are located. I was 3 years old when we bought the lot from my uncle, and had a house built (there are several identical homes that were built in the area at the time, most modified since then). The land and house cost $7000.00 back then, in 1948! We had lived in Azure Vista Naval Housing before that, which was below PLNU, not far from the end of Sunset Cliffs Blvd. I moved away from the beach area in 1968, but only 10 miles or so. My parents moved to Ohio for 7 years, but my mother came back 3 summers in a row to manage the San Clemente Inn at the foot of Newport Ave.. I remember Stratty (Paras Shop) fondly. Sulek’s Waffle Den, the “other” drug store, which moved twice, first across the street from Virgil’s market, (later Thrify Market, where I was a box boy for awhile.) back in my college days. Can’t remember the owners name of the drugstore, but it was later called Sav-all Drugs. Dr. Oster, later Dr. Berrett, were my doctor’s at 1947 Cable St. Dr. Land was my first dentist, later, the guy over at 1947 Cable (name escapes me) I remember Meyer’s & Stuart Mobilgas. Knew Mr. Meyer (was it just Myer’s?) Strand Toy Store, Bank of America and First National Banks, and, it cost 25 cents to go to the movies at the Saturday matinee. Pop corn was a dime. They had a self serve soft drink machine and it had four flavors, and you could push all four buttons at once and get a “suicide coke”! I even drove for ABC/Ocean Beach Cab Co, for Mr. Perry Black who won the outfit in a poker game, it was rumored. There was a good Italian restuarant next to the ABC cab office, can’t remember the name right now. The stationery shop was called Perines, if I remember, or maybe that was the owner. We had Days-o-fun, parades, OB kite day, a carnival at the parking lot at the foot of Newport. Of course, I ate at Nati’s, ever since 1960. Vern Lontz owned it then. Maria was his first waitress. Remember the Ocean Beach Bowling alley? 12 lanes, and the Arizona next door. Homer’s was our first five and dime, Cornet came in around 1958, maybe? My mother sometimes bought clothing at Veda Moss, and of course , lowne’s and Elm’s, that ‘s when we didnt go to Sears or “Monkey Wards” , LOL! Well, I have rattled on enough, I hope to post more later. Anybody remember Zeke’s on the corner of Bacon and Newport? Roger – welcome back, dude. Sure, I remember all those places. Yup, remember Zekes’ antique shop and chicken all in one. He would serve out that side window that used to front on Bacon. Nati’s is still there, and in fact we hope to interview Luisa who has been there for over 51 years. Check out some of other historical pieces – go to the navigation bar and hit Ocean Beach Time Machine. There’s several posts about the Strand. Come back and visit anytime. Great trip down memory lane, Roger. Think that the stationary shop was Burdine’s. Remember Denny’s? Mayfair Market? Ah, times keep changing. Many of the homes in Ocean Beach came from Sears. They were sold as kits, back in the old days. I believe mine is one. Hi, Frank and Judi! Yes, it was Burdine’s. I remember Denny’s and Mayfair market. The was a restaurant across the street from the Strand theater, where the crosswalk is. I think it has been a Mexican restaurant for many, many years, but back in the fifties it was something else. Anybody remember? Frank, I ate at Nati’s just two or three months ago. I think it was Luisa that I saw there, but she wasn’t our waitress this time. Maria no longer works there, but I did hear, maybe a year or two ago, that she still does the bookkeeping for Nati’s… I live in Running Springs, near Lake Arrowhead, but I spend most of my time in Crestline, but I manage to stop down in O.B. maybe 3 or 4 tmes a year. Hey! Anybody remember the old Irish Priest who used to walk his dog all over OB, and he’d say: “God love you, honey!”? I went to the Presbyterian Church over by Point Loma High School, but everybody knew the Preist from Sacred Heart Church. Also, do any of you remember the Waggoner girls, both attended Point Loma Hi, and both worked for Stratty. The first Safeway was on Newport, next to Cable, across from Myers & Stewwart Mobilgas, with it’s own parking lot, later moved across from Ocean Beach Medical Group. I never went toPacific Shores Bar, but when I drove cab, I picked many a customer up from that bar. And, last, but not least, anybody old enough to remember Vesta M. Petersen, principal of Ocean Beach Elementary in the 50’s? And Mr. Grant and Mr. Lee, Mr. MacLaren, oh, and Sav-all Drugs started out as Ward’s drug. We knew Mr. Ward, and I knew his daughter, Sue Ward. Bye for now! I picked up your post through researching Vesta Peterson on the internet. I still remember her 1950 Chrysler, which was generally parked on the west curb. I remember Mr. Grant trying unsuccessfully to teach me art. It’s been awhile, but I think the son of the owners of Wards Drugs was a contemporary. Miss Rankin at the OB Library was always pleasant and anxious to help library patrons. Miss Gladys Worman was my 4ht grade teacher, and Carol Trenley Huckaby handled my 6th grade education. I still remember the old Safeways. The first was on Voltaire. (The building still stands.) They then moved to Newport. I can still remember my parents getting two brown bags of groceries there for under $5. Thanks for your post, now over a year old, LOL! David, I loved living in OB! Mr. Grant and Mr. Webster and Mr. McLaren were my favorite teachers. Well some mispelled words and some missing letters. The was a restaurant should have been there was a restaurant, and the second spelling of priest came out priest. My fingers are dislexic, or is that ledixics? Blue Pacific Nursery used to be on Newport Av, too, about where the Cornet (now antique place) parking lot is. It moved in the 60’s one street over. Remember the old furniture store that used to be right on the beach? It was the old Merry-go-round building from Wonderland. Does anyone remember their assigned Space Number from Spaceman (Clint Carey)? For awhile he lived at the San Vicente Inn. Do any of you OBceans have any idea where any of the memorabilia might be that has anything to do with Wonderland? I’ve become a bit obsessed with this amazing place and am looking for any flyers, postcards, photographs, books (already have Beach Town of course) or even any part of the rides that existed way back when. Any lead would be appreciated. Did you check the SD Historical Society in Balboa Park? I think they probably have a lot of old photographs. I know I bought one from the Union Tribune (it was a set of 3 from different beach areas). I think the Land Title & Trust company has historical photos of the place. Look up their website, don’t know what it is, have to leave for a meeting, but tonight I hope to post if you don’t find anything. When I was a little feller, 4 yrs. old or so, My dad worked for Elmer Larson at Ocean Beach Auto Upholstery on Newport. Next door to the nursery and I can remember that Safeway was on Newport, where the James Gang was located for years,before Safeway moved to Santa Montica st. Hey, I don’t make street signs I just read ’em. Later learned how to do a little leather crafting on Abbott st where Jon’s surf shop used to be. Also was the pottery place. Anyway, it gives some details on Wonderland. YOU FORGOT THE 500 MONKEYS! Hehe, as alluded to in your last post’s link and the picture with the monkeyland sign, they also had a petting zoo which at one time had as many as 500 monkeys. Most of what I know about wonderland is from Noah’s PBS piece. Thanks Roger. I think that is most of the info that is in Ruth Held’s book, Beach Town. There has to be promotional literature or related items just sitting in people’s homes here in OB or somewhere close by that have lived here a long time. Maybe they’re not on the Net and don’t know anyone is even looking for that kind of stuff. And seeing how the guys on American Pickers (TV show) can find remnants of amusement park rides just lying around on people’s properties, I keep hoping that will happen here! Here is a Youtube video: It starts out talking about Mission Beach’s Belmont Park, but a third of the way into it, it talks about the even bigger Wonderland in OB. I seem to remember a Ruth Held. Did she once attend Point Loma Community Presbyterian church in the 50’s and 60’s? I know that some sort of old photographs exist at Land Title and Trust, historical photos, the Land Title office was downtown San Diego, and they have 1000’s of old photos. Still looking for it. Roger, awesome video with Wonderland in it, thank you so much! I have to see if I can get in touch with that guy with the postcards and photos in that vid. Those were some I had not seen before. People like Pat James and others on here would know more about Ruth than I would. I only met her daughter at the OB Historical Society last year and she gave me that book which started my interest in Wonderland. Anything else you can find would be great! I hope you can find more info on that Land Title place, sounds promising. Another thing, if anyone can walk with me and show me what would have been the approx perimeter and or dimensions of Wonderland, that would be great. Being an archaeologist, it would be of interest to me. OB Mercy, I’ll be trying to find more tomorrow. Heading to bed right now. Long day! Well, I lucked out on this one! Great video, Roger. Last night, while trying to get to sleep, I remembered another few places of OB. Smith’s Jewelers on the south side of Newport; across the street was a place I used to buy salt water fish for my daughter’s tank, and just a few doors down from it was a beauty shop run by Fred and Marcella Duncan. Wow Roger, you’ve really done a great job finding stuff! The SD History web site has awesome photos! I only looked a few place on that site just now but did not see any Wonderland stuff, but I’ll look more when I’m not at work. I remember Smith’s jewelers really well! Bouight some stuff from them many moons ago! I think I remember the fish store as well, it was also on the south side of Newport Ave, in the same block as the Strand, right? Masybe we can find out more about Wonderland. I’ve seen newspaper articles on it over the years. As I said the old building that housed the merry-go-round was a furniture store back in the fifties. Nicolette, I remember Virgil quite well. In fact, his son Wade, used to hang around our house up at the corner of Venice and Cape May. He was interested in Ham Radio and often came over for dinner, and we watched TV. Later on, maybe 1961 or 1962, the market was taken over by the Leong brothers and became Thrifty Market, which later moved across from the Jack in the Box on Votaire at Cable St. Was Wade your dad or an uncle? He’d be around 72 or 73 by now, I think. Sad to hear Wade passed away. He hung out at our house for several years, a close family friend. I later worked at the market when I was older, when it became Thrifty Market. George, Joe, can’t remember the third brother. They moved the market from Newport Av. To Voltaire a few years later. The fifties and sixties were a wonderful time when I knew so many neighbors and merchants. Each year Ocean Beach Elementary School had a Kite Day parade down Newport Av in March. Wade was a lot of fun to be around. Lost track of him and so many others when I moved away from my parents house in early 1967. It’s so nice to hear from you! I am about to turn 70 and hearing from you brought tears to my eyes. So many memories! Again, thanks for getting back to me. I never knew Wade had moved to an island in the Indian Ocean. Thank you Roger. Its people like you that keep memories alive for all, so happy to have crossed paths. My aunt Wendy will be visiting next month, I’ll find out from her exactly when Wade moved to Raratonga. I’ll definitely keep in touch. You are a blessing. Take care. Thanks, Nicolette. I am wondering if I ever met Wendy. Ask her if she knew the Smith family up on Venice St. at Cape May Ave. So many memories coming back. Wish I could afford to live there now. Our first house we bought the lot from my uncle, and the lot and the 3 bedroom 1 bath house of 1106 square feet with a detached two car garage cost $7000 to build in 1948. We lived in Azure Vista, former Naval Housing for a year before that, only two miles away. I helped to build the Cape May Av house in 1961. My mother designed it, and others routed the electrical, plumbing, etc. It cost $21,000 back in 1961. Today it would be worth about a million. Anxious to hear if Wendy remembers Roger, J. Roy, or Deane. How is everyone doing down in Ocean Beach? I sure miss Spaceman…and Stratty Paras, and the Waggoner’s…and Ted at Elm’s Clothiers…And Mary at Lloyd’s Toy Shop next to the Arcade Beauty Salon. and Myers and Stuart, and well, so many great people. and Red the barber at the barber shop next to the Strand Theatre…And Mr. Ward at Ward’s Drugs (later called Sav-all Drugs… I went to school with Sue Ward, his daughter. Anyone old enough to remember Vesta M. Petersen, principal at OB Elementary? Mr. Grant, Mr, Lee, Mr. McLaren, Mrs. Huckaby, Mrs. Drummond, Mrs. Drennan? I’m heading back East for 17 days, but I’ll make it down to Natis later in August. Anyone remember Virgil’s Market (Virgil Swoboda?) later Thrifty Market? How about James D. MacDonald, MD, Dr. Oster? Dr. Berrett? Dr Harbaugh? Dr. E.K. Distler? Hi Rodger, my Grandfather is Virgil Swoboda. Did you know him? Or maybe my mother Virgie Swoboda ? Where is everybody? You can’t all be surfing this late at night, LOL!!! Anyone remember Ocean Beach Elementary’s venerable old principal, Vesta M. Peterson? Knock Knock! Where’d everybody go? Did everyone fall off Sunset Cliffs, or were you all abducted by Spaceman of O.B.? Hi Roger. Don’t think that everyone fell off Sunset Cliffs, but with the construction that is currently going on – and should go on until March or so, there may not be a “Sunset Cliffs” any longer. I cannot see how they can put in new pipes, all the way to Ladera St., without adding to the erosion of the street itself. So…I think that there are two factors here: Some of us are trying to navigate out way home via Sunset Cliffs and detours, and others of us are at Balboa Park’s “Occupy San Diego” protest rally. (It’s a little bit like the 1960’s and the “Free Speech Movement.” We are just glad to know you still care. Make that “Balboa Park/Civic Center”. Wow! Some Obecians are still alive! You were all captured by the Mother Ship?